More than half a century ago (yes, I am that old) God blessed Mary & Dominic Rebello with their first son –ME! I was born and raised in Mumbai India, in a little village in Vasai. I am blessed to be part of a “small” family of seven. I have two brothers (George and Richard) and four sisters (Irene, Priscilla, Georgina and Theresa who died at the age of 4). But that is not it – I am also an uncle to eleven nieces and nephews and ten grand nieces and nephews. I must add that my nephew and his lovely wife are expecting their third child around Valentine's Day. I was ordained to the priesthood on April 8, 1989 at St. Pius X Seminary in Mumbai, India. Over the next 11 years I went on to serve in the missions of India, to build a school, to be elevated as the youngest pastor in the Diocese of Baroda, to serve as Director of Social Work & Catholic Relief Services, and the rector of a hostel. I was always on the go. I was a happy priest who loved to serve God’s people. So in 2001, off I went to America. For three years, I served the people of St. Philip Neri with gladness. Especially dedicated to working with the youth, I organized mission trips to work with the poor in Appalachia, West Virginia, retreats to Our Lady of the Isle, and of course World Youth Day in Toronto Canada. Never losing touch with the child within myself, you could always find me playing soccer with the children in the school yard, attempting to dance the latest crazy dance or enjoying the scariest of all rides at Splish Splash. I am a huge sports fan – Jets, Mets, Islanders and Knicks. Back in India, I was an excellent cricket player, a good heater as well as a catcher (cricket positions). So please don’t mess around me! Ha, ha, ha! I have been told that my laughter is infectious and my hugs sincere. You will often hear me say “Here’s a hug – it’s a free!” I fell in love with the people and they fell in love with me. But soon the transfer assignment from the Bishop arrived and it was time to move on. Over the next 4 years I went on to serve as Chaplain at Mercy Medical Center and then associate pastor in St. Joseph Kings Park. And once again – the transfer assignment from the Bishop arrived and it was time to move on – to St. Barnabas parish in Bellmore. During my 6 years in St. Barnabas, I was happy to serve as chaplain to the Knights of Columbus and the Rosarians. Training and scheduling the altar servers and teen sacristans, coordinating the Family Liturgy and encouraging our young people to serve as Junior and Lead Lectors as well as working with the Baptismal Team kept me quite busy. Visiting the homebound and sick, counseling those in need, presiding at many marriages, baptisms, first communions and funerals – I cannot begin to count the many ways these experiences enriched my life and my priesthood. In my personal life, during this time my dear father passed away. In 2010 I was overjoyed at being incardinated as a priest in the Diocese of Rockville Centre and then in 2012 I became a naturalized American citizen. 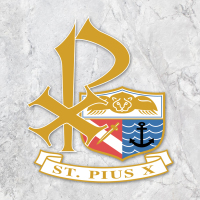 And then the most wonderful letter from the Bishop Murphy came in March 2013 – assigning me as the next pastor of St. Pius X, Plainview! I had to read it a few times to make sure it was real. If you are reading this letter carefully, you will remember that I was ordained at the St. Pius X Seminary. What better place to begin my journey as pastor than with the people of St. Pius X parish.